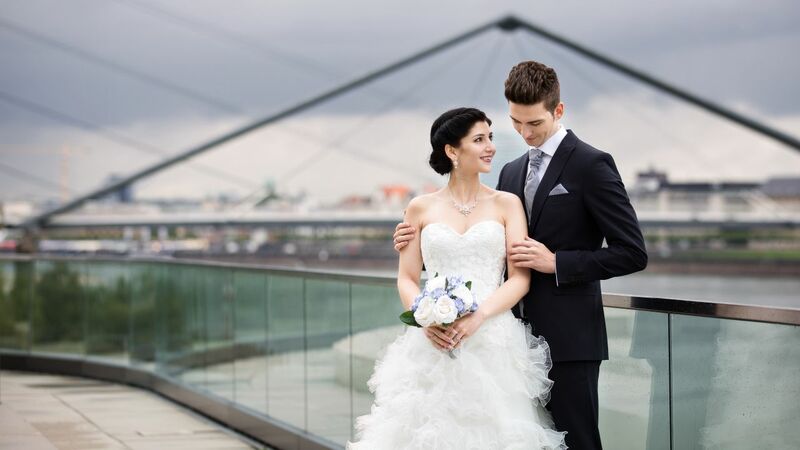 Hyatt Regency Dusseldorf offers the ideal setting for a dream wedding and not only convinces with spacious and bright rooms for your party, but with its individuality. We make your wedding dreams come true - personally and with heart! Whether you are planning an exclusive wedding dinner in the company of your closest friends and family or for a festive wedding with dancing in the ballroom, our in-house wedding planners are always there for you from the first minute to design your unforgettable wedding day with you. For a personal consultation or enquiry regarding your dream wedding at Hyatt Regency Dusseldorf, please contact our wedding specialist on +49 211 9134 1728 or via e-mail at dusse.rfp@hyatt.com. Hyatt Regency Dusseldorf is located at the tip of the peninsula overlooking the spectacular skyline of Dusseldorf, the Rhine Tower and the Media Harbour. Surrounded on three sides by water, you will experience the most beautiful day in your life with a wonderful view. Enjoy fabulous views of the River Salon rooms and Pebble's Bar at the tip of the island or let the Chef’s Table be your choice with the Media Harbour as your visual backdrop. 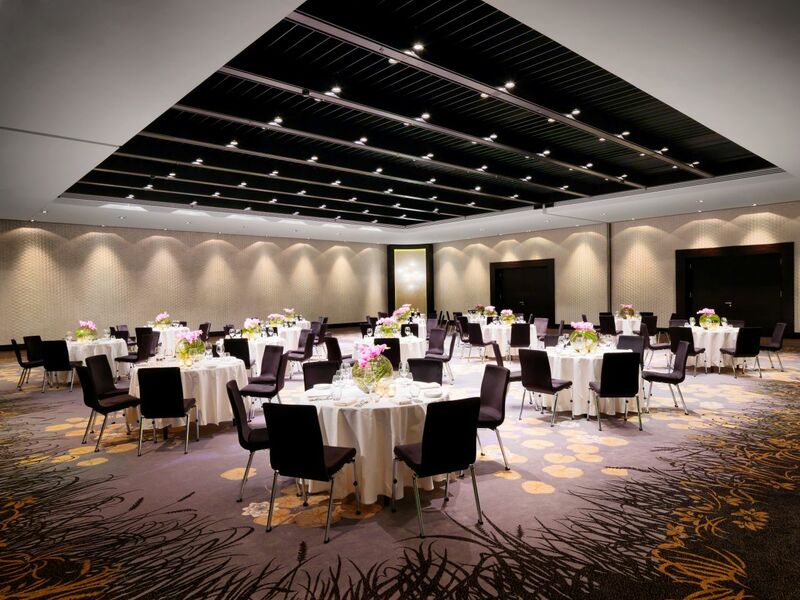 The Ballroom impresses with the water-flooded glass ceiling through which the daylight streams through, and the outer area of the peninsula offers an incomparable setting for wedding ceremonies. Our floral designer Fiori has an eye for the most beautiful and most extraordinary flower arrangements and floral designs you can imagine. He will help you with the right choice of decoration for any location you choose. We also assist you in choosing the right decoration such as chair covers and menu cards down to the smallest detail. Extraordinary Hyatt cuisine is showcased in an exclusive menu custom-designed to meet your tastes and create a culinary experience on your wedding day. Corresponding beverages and excellent service complete the meal. Whether you are looking for a DJ, a solo artist or a live band, we will find the right musical accompaniment for your celebration. Spend your wedding night in one of our suites and let yourself be pampered. For guests at your wedding celebration, we offer a special overnight package. Start the day after your dream wedding with a romantic champagne breakfast on the Rhine and enjoy intimate moments. Choose your personal love-route and think back over the past night. Do you want us to organise your wedding with one of our wedding offers from 20 or more guests at Hyatt Regency Dusseldorf? We offer you a free overnight stay for the wedding couple and a romantic dinner for your first anniversary. 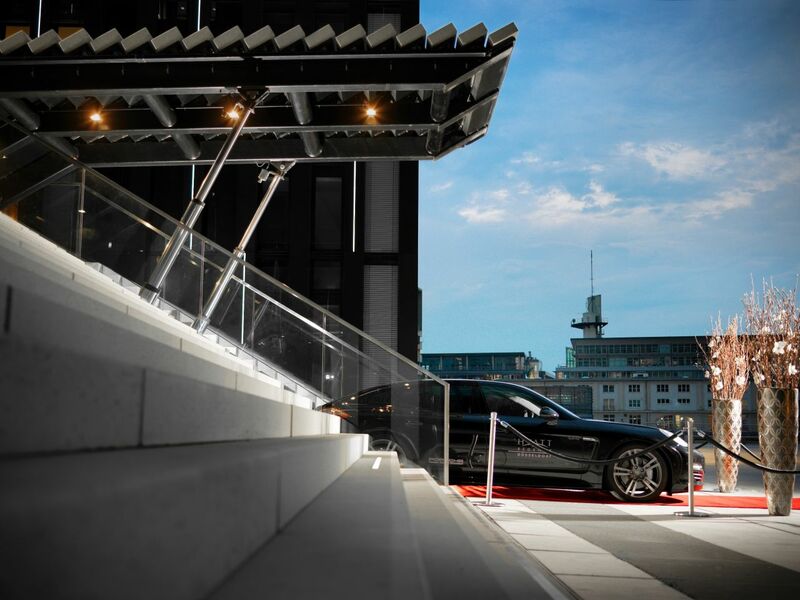 To make your arrival at the Hyatt Regency Dusseldorf is as comfortable as possible, we are pleased to offer on-site valet parking (valet service). The parking fee is €2.50/hour or €23/day. Our wedding coordinator is happy to assist you in choosing the right wedding photographer to capture the most beautiful day of your life on film. Whether it is portraits, collections of the wedding couple and the wedding party, the wedding dance, or a photographic story of the entire day, your wedding photographer is entirely at your disposal. Recharge your batteries before your wedding with a soothing massage, application or beauty treatment at the Rive Spa. 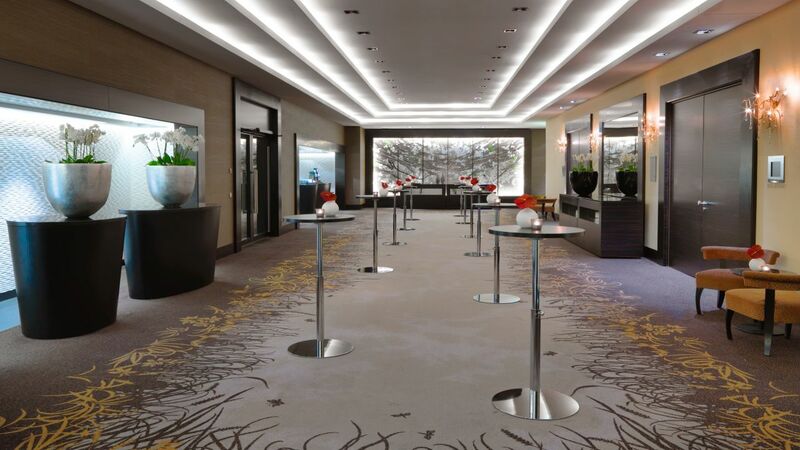 At Hyatt Regency Dusseldorf complete equipment can be rented (video production systems, video projection, laptops and sound and lighting systems). Experienced technicians ensure the best possible local support. View a detailed equipment price list. Pictures say more than 1,000 words. This saying is just as true, of course, for "moving pictures". The videographers of for example just memories capture the moment, the highlights and the emotions, on video for you. 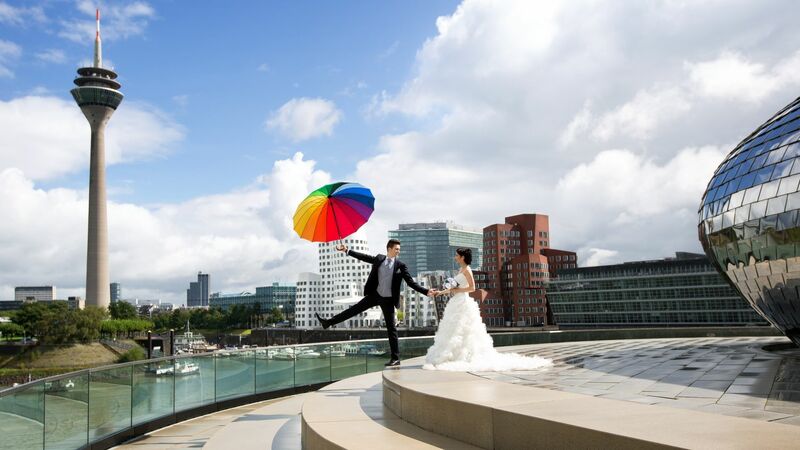 Dive into the moving pictures of just memories and a wonderful wedding at Hyatt Regency Dusseldorf. Our wedding coordinator is at your disposal throughout the arrangements and on your wedding day, and will help to create an unforgettable day for you and your guests. With “World of Hyatt, meeting and event planners are eligible to earn points for events and overnight stays to enjoy valuable benefits such as free nights. Sign up today and become a member of World of Hyatt. 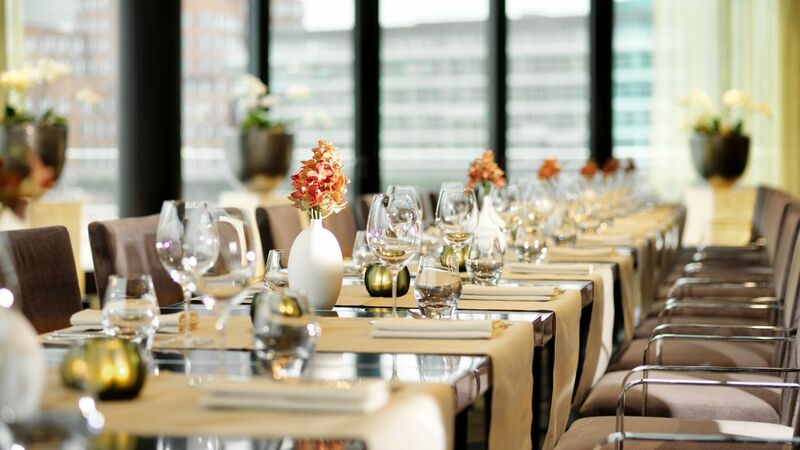 In the tradition of Hyatt Hotels, Hyatt Regency Dusseldorf offers special gastronomic experiences. Our experts offer individually tailored menu suggestions for the success of your wedding. A truly memorable event always features deliciously tempting food and drinks. Whether in our elegant banquet facilities or in the private dining rooms, our talented chefs will create inspirational cuisine, designed to fuel energy and fire imaginations. Our experienced staff will dazzle your guests with their creativity and finesse. Our aim is to make the best day of your life memorable for you. Our wedding specialists have put together attractive offers that make it easier for you to choose from the wide range of options and to find the perfect idea or suggestion that suites you. It is valid for 6 hours. We offer a wide variety of wedding menus to suit all tastes and preferences. If our existing plans do not meet your needs, our experienced team will be happy to work with you to fulfill your requests. Of course. A complete tasting of all the selected menu items will be scheduled several weeks prior to your wedding. If your wedding takes place at our hotel with more than 30 people, you will be invited to a sample tasting for two people. Only the drinks during the tasting will be at your own expense. Is it possible for you to provide special dietary meals? Yes, our event chef will be more than happy to prepare the requested meals. All special dietary requirements must be addressed at least one week prior to the event. You can elect to have an open bar, a limited selection of wine and beer, or a cash bar. Our wedding co-ordinator will advise you of the costs and inclusions for each option. Do you have suggested suppliers for flowers, music, photography, etc? We work on a regular basis with several supliers. We will be happy to share our experiences with you. Generally, yes. All decorations must be approved by the hotel and must comply with Hyatt Regency Dusseldorf Fire Codes. Decorators must be licensed and provide proof of liability insurance. The hotel will not permit anything to be affixed to the walls, floors or ceilings of the rooms with nails, staples, tape or any other damaging substances. Can I host a morning-after brunch at Hyatt Regency Dusseldorf? Certainly. We will be more than happy to discuss with you the appropriate private room. Yes, all the prices include VAT at the standard rate. Deposits will be required prior to the event. The hotel’s check-out time is 12:00 noon. We will of course try and accommodate your guests’ requests, although this will depend on the hotel’s overall occupancy of on the day in question. Can we provide a special block of rooms to our guests for their own reservation? Yes, this is possible. For a minimum of 10 rooms, we set up your own room allotment with rates previously agreed and with your party’s booking code. Your guests will be able to arrange their room reservation by telephone or via the internet with the booking code offered.